I recently purchased the Big Buddha Pearl from Zappos.com, retail value $89.99. I wanted a little larger bag for traveling and work. When i spotted my coworker with it, I knew I wanted one too. 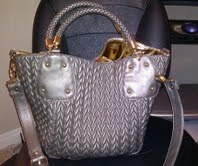 the handles are braided and the bag is made of a soft quilted material. It comes with a smaller pouch ( that I’ve been using as a makeup bag) and a cross body strap. The one con to the bag is that the lining is kind of a tacky gold but once your stuff is inside it’s not so bad and the bright interior makes it easy to find things. This is a fun summer bag for an affordable price.